unique inside view of New York City. Specializing in lesser-known and often surprising aspects of New York City, these publicly available tours delight both New Yorkers and visitors alike. Check the Public Tour & Events Schedule for a complete listing of upcoming tours. Please check back often, as tours are added regularly. Feel free to join us on any listed tour. As these tours are sponsored by various organizations, individual tour prices vary. 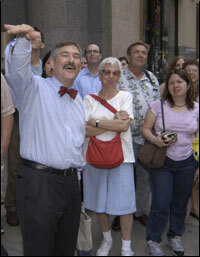 Join us on early evening walking tours of different neighborhoods every week. Open to the public. No registration required. Since the 1970s, the Wolfe Walkers have trekked, trained, and bussed through the lesser-known areas of NYC and beyond. Justin Ferate, who also conducts many of the tours, is the coordinator of the Wolfe Walker tour program. In addition to his other tour activities, Justin regularly conducts tours for other organizations that are open to the public. Please check the Public Tour & Events Schedule to see what tours may be coming up in the near future. Also, check the schedule for special events, which, while not coordinated by Justin, might provide an interesting New York experience.